Tmsuk, the Japanese manufacturer that makes the robot, sold three last month to a hospital, where they are working as full-time, rather than temporary, receptionists and guides, said company spokeswoman Rie Sudo. One of the hospital’s robots serves as a receptionist and has been programmed to greet visitors. It also has a touch-panel on its body, and visitors can use it to get directions for where they want to go. “Just give it electricity, and a robot can work for long hours, even doing repetitive work, and you don’t have to worry about labor laws,” Sudo said. Japan’s declining birth rate means that in coming years it could face a labor shortage, and some experts believe that robots could be part of the solution to that problem. 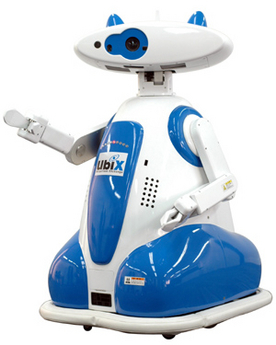 Robots are very popular in Japan partly because of the popularity of “manga” comics and animation that portray robots as friends and aides to humans.